PORT-AU-PRINCE - French President Emmanuel Macron pledged to cut through red tape to quickly rebuild the islands of the French Caribbean during a visit on Tuesday meant to dispel anger at his government’ s response to Hurricane Irma, which killed at least 43 people in the region. The clutch of Caribbean islands hardest hit by the storm were mainly overseas territories belonging to Britain, France and the Netherlands, whose tens of thousands of residents are European Union citizens. The U.S. Virgin Islands were also hard hit. European countries and the United States have sent troops to deliver aid and provide security after the storm toppled homes and hospitals, but locals and tourists short of food or shelter say help was slow to arrive. Macron, who is also facing the first test at home of his resolve to reform the economy with a day of protests against his labour reforms, denied authorities were too slow to react. Basic services in the region were lost after Irma, weakening law and order, and looting erupted on some islands. Haiti’s government said on Tuesday more than 10,000 people were in shelters after heavy rains flooded the former French colony. 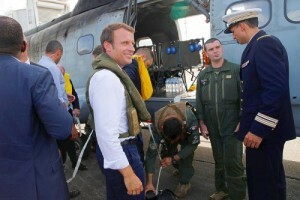 Macron was due to travel on Tuesday to St. Martin. Most of the 10 people killed by Irma lived on French territories there. “St. Martin will be reborn, I promise,” Macron told reporters in Pointe-a-Pitre, on the French island of Guadeloupe. “I will shake up all the rules and procedures so the job is done as quickly as possible. It will be done quickly, it will be done well, and it will be done better,” he said. Macron said 50 million euros will be made available as soon as possible, and 2,000 security forces have been deployed, including the army, roughly double the original contingent. The French government has said it would take at least three months for water distribution to normalize. The electricity supply has also been badly hit, authorities said. British Foreign Secretary Boris Johnson also traveled on Tuesday to the Caribbean to visit British territories devastated by Irma. Among the hardest hit islands were the British Virgin Islands, Anguilla, plus Antigua and Bermuda. “He is very keen to see for himself the devastation, to reassure governors who have done a magnificent job under quite the most incredible pressure,” said Alan Duncan, Britain’s minister for Europe and the Americas. Four people had died on Anguilla, up from one reported previously, Duncan said, while the death toll on the British Virgin Islands had risen by one to five.